Recently I have been working on a site that sort of uses Magento’s Store Views for something they are not primely intendant for. Sometimes site owners have a problem with grasping all those features Magento offers. 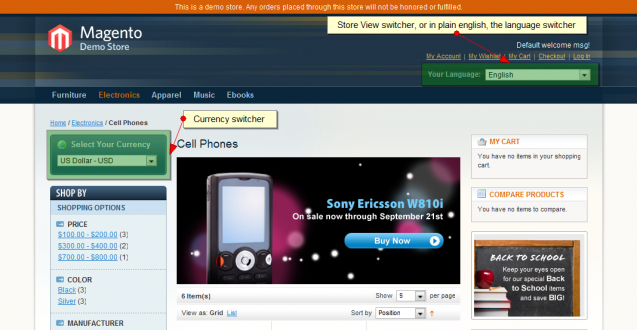 Magento has pretty great support for locale, translations, currency etc. Let me try to explain the “issue” in title on practical example. Sometimes site owners have problems with grasping the concept of Store views and they tend to use it for wrong purposes. 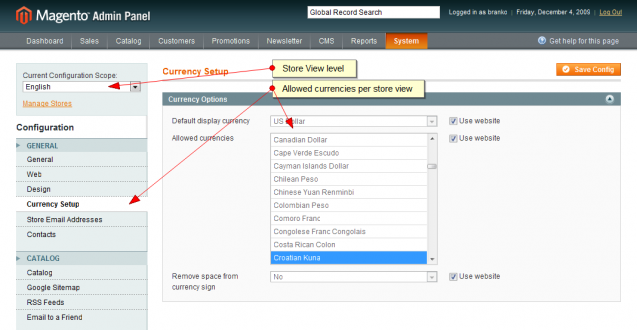 Using multiple Store View’s to define multiple available currencies is one such example. Lets say you wish to enable Euro and USA dollars as available currencies. Creating a two store views (lets say you call them StoreViewEuro and StoreViewUSADollar) to handle this request is wrong approach. Available currencies can be defined per each Store View level. See the screenshot below. And here is a screenshot of how valid setup of multiple languages and multiple currencies looks like. Hope this clarifies a thing or two for some. If you want different base currencys for each (i.e. you want Euros to be _processed_ in euros and dollars to be _processed_ in dollars) you’d need to use 3 store views, no?